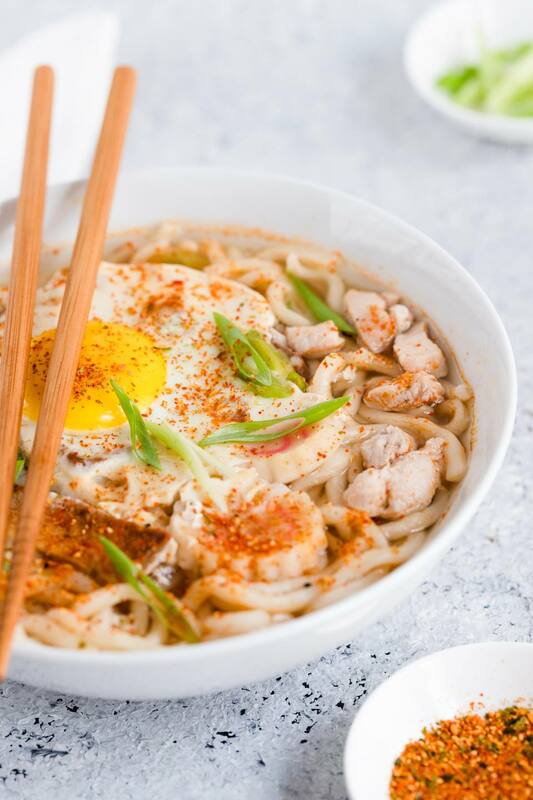 Miso udon noodle soup, also known as miso nikomi udon in Japanese, is a rustic dish of thick wheat udon noodles simmered in a savory miso broth with various ingredients such as fried tofu (aburaage), fish cake (kamaboko), chicken, and green onions. Other ingredients that can easily be incorporated into miso udon noodles soup are nappa cabbage leaves, enoki mushrooms, or seafood such as shrimp. Tofu can easily be used to substitute chicken or other meats as well. The miso broth for miso udon noodle soup is a simple mixture of miso paste and dashi stock. The miso paste may either be white miso paste, red miso, or a combination of both types of miso known in Japanese as awase miso. Miso is sold either as a straight miso paste or as a miso paste with added dashi flavor. When making this dish, make sure to make minor adjustments for miso that is pre-seasoned with dashi. The dashi stock is needed to season the broth, especially when traditional miso paste without the added pre-seasoned dashi is used. As far as the type of dashi stock that is used in this recipe, either bonito (katsuo) stock or kelp (konbu) stock may be used. If you will not be preparing homemade stock for use in this recipe, an alternative is to use a dried dashi powder. Both bonito and kelp stock is available in dried dashi powder form at Japanese and Asian grocery stores. In a small pot of water, cook the frozen udon noodles for 2 minutes. Drain well and set aside. In an earthenware pot, add dashi stock and bring to a boil. Reduce heat to medium. Add miso paste to the broth by first dissolving the miso with a bit of the dashi broth in a small bowl or ladle. Then, incorporate it into the miso and broth. Next, add sake and sugar to the miso broth. Add chicken to the broth and simmer on medium heat until cooked through. Add udon noodles and bring to a boil. Reduce heat to medium-high. Add sliced aburaage (fried tofu), negi (green onions), and, optionally, kamaboko (fish cake) and cook for about 10 to 15 minutes so that the udon noodles absorb the flavor of the miso broth. Optionally, add a poached egg to the soup by simply cracking an egg over the soup, then cover the pot with a lid and cook for 2 minutes then turn off heat. Serve the miso udon noodle soup in the earthenware pot. A general rule of thumb for using dried dashi powder is 1/4 teaspoon of powder to 1 cup of water. The only special equipment you may need is an earthenware pot for cooking the miso udon noodle soup.